okey, do u have any permissions wiki ? so u just can copy the permissions over to the folder :)? @blomman2 Not sure. I'll have a look. I'm having trouble for the permissions. 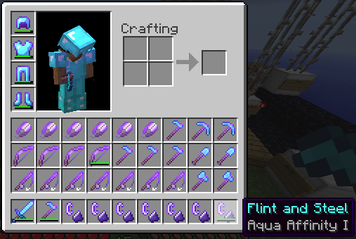 When i try to do Enchantmore.axe.aquaaffinity on GroupManager, The permission doesn't seem to work. Please tell me what to do to fix this? You are the best damn plugin creator here! Keep going! @Ubique1964 Use a Permissions plugin to give them the permissions for certain items. Structuring of permissions is mentioned above. Wonderful and quirky ideas. Thank you so much for all of your work and time. Am I able to use this with a web based donation/purchase plugin like Buycraft? @Aya1379 I uploaded a new file yesterday fixing that. Hopefully it will be approved soon.